Gtmhub OKRs Feshdesk integration. 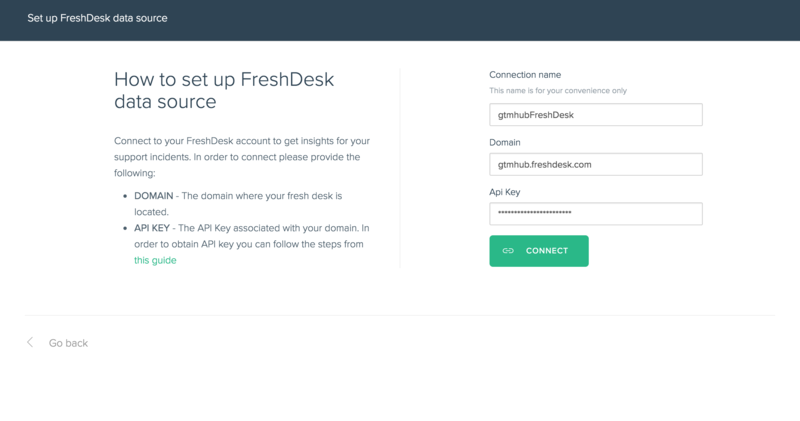 Connect your Freshdesk account to Gtmhub to use real time data to automate your OKRs progress tracking. FreshDesk is a Customer Service Software and Support Ticket System vendor. By integrating FreshDesk in your account you will gain valuable information about the performance of your customer service as well as your support efforts. From the Choose a Data Source dialog navigate to Operations tab and choose FreshDesk. In the Api Key field enter the api key associated with your domain. Additional information on how to obtain an api key can be found here. The next step is to start syncing your FreshDesk data and build insights to analyze it.